I did it, and there is now one less thing on my bucket list. 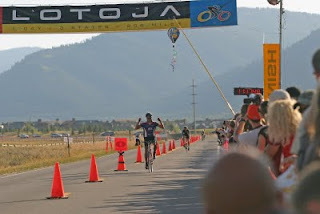 My goal going into LOTOJA - a crazy, 206-mile, one-day bike race covering three states and comprising 10,000 feet of climbing - was simply to finish it with a respectable time, and to enjoy the beautiful route as much as possible. Mission accomplished. Pedaling into Jackson Hole, WY that afternoon was one of the most fulfilling moments of my life, realizing I had left Logan, UT that same morning...on my bike. My official time was 10 hrs. 53 min. 48 seconds, including one flat tire which cost me about 10 minutes. Tough headwinds also cost all of us some time, but thankfully temperatures were warm and skies were clear. It's a day I'll never forget. With 1,500 cyclists starting, they split everyone into groups of about 40 and staggered by 3-minutes. My Cat 5 group started 24 minutes after the first Pro group, so take the finishing clock's time of 11:17:48, subtract 24-minutes, and there you have it. Overall, I finished in about the top 1/3 of the race. I am a mountain biker at heart, and have done several cross-country and endurance races on the dirt. I got a road bike a couple of years ago to extend my riding season, and suddenly here I am. I do well on the climbs, and endure the flats. I didn't really even know how to ride a paceline until this spring, but I've enjoyed the challenge of a new discipline within a sport I love, and the speed of a road bike is awesome. Besides, my R.U. Outside store & warehouse have been in Logan for the past five years, and Jackson is my backyard...so LOTOJA called to me. I mainly have my cousin Brent (center in this photo) to thank for getting me on board the LOTOJA boat. He has now done it 5 times, and is a beast on the bike. His finishing time this year was 9 hrs. 44 min., nearly putting him on the Cat 5 podium. 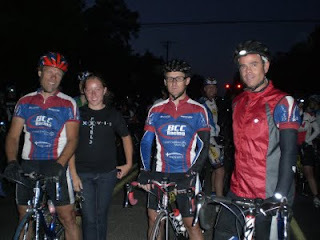 We did a handful of training rides together this spring & summer, which really helped me out. 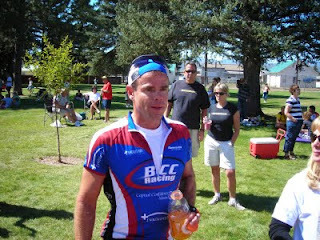 Plus, Brent has been very involved with the racing contingency of Bonneville Cycling Club out of Salt Lake City, so they were my team for LOTOJA. A really good bunch of people (including Adam and his wife, on left here). Race re-cap: start time of 6:49 a.m., 48-degrees in downtown Logan, Utah when the starting gun went off. Quickly dropped to 44-degrees by the time we had ridden west down by the Logan River and farm fields; I don't function well when cold, so I was really glad I had opted for arm warmers, leg warmers, thin vest and shoe covers. 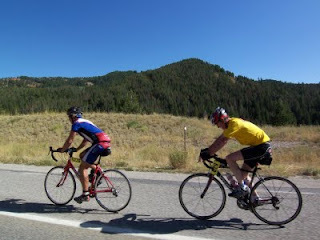 I managed to stick with the front of our group for the first 34 mainly-flat miles to Preston, Idaho, including a couple of exciting merges with other groups. The sunrise was spectacular, with steam rising off the river and waterfowl waking. In Preston, Brent's wife Beth, son Haeden and cousin Chase helped me transition out of my layers, handed me a fresh water bottle and off I went. Brent, Adam and the other super-fast guys had surged ahead by then, so I settled in with other racers for the duration. 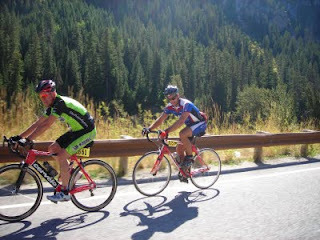 From Preston, the route climbs nearly 3,000 feet up Strawberry/Emigration Pass towards Montpelier, Idaho. They close that section of road to vehicles for the race, which allows for sublime riding. Fall colors were starting to pop at the upper elevations, making it even better. I did a good portion of that climb with Johnny, a great 21-year old kid from Reno, NV who turned out to be from a team sports background like me. Look for him playing cornerback at a university near you soon. I felt good on most of that first big climb, and Johnny & I passed a lot of other racers, but at about the 50-mile mark (2.5 hrs.) my hamstrings started cramping. It's a pretty ominous feeling to deal with when you have over 150-miles to go. I can't attribute it to anything in particular, but am learning it almost always happens to me at the 2.5 hour mark of endurance events. I've also learned that if I just back off the throttle a little, I can ride through it and still finish strong...so that's what I did. Descending into Montpelier was probably the most frustrating part of the race for everyone: the dreaded headwind hit us. It was impossible to break off and pedal on your own, so we all tucked into groups and did paceline work. I made it to the Montpelier feed zone at mile 80 in 4 hrs. 4 min., about 8-minutes behind my goal, but was feeling pretty good. 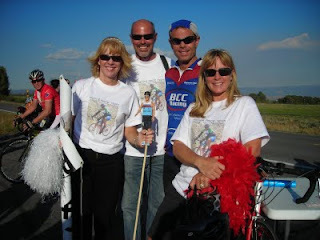 Mom, dad, sister Lisa, and nephews Blake & Tyler were there to replenish my sports drink, water, bars & gels. Seeing everyone like that is always a nice shot in the arm, and I was off towards Geneva Pass...the second big climb of the day. Incredibly, the headwind continued, making the climb doubly hard. Traffic is also thankfully diverted from this section of road during the race, and the scenery is beautiful...but the climb was tough. 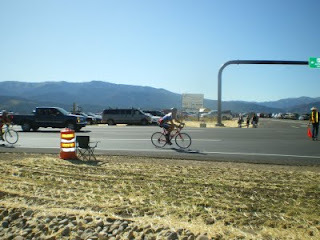 I finally found a good rhythm on the final two miles, which are also the steepest, and passed a good number of riders. Then, exactly 1/4-mile from the summit, it sounded like a gun went off and my front tire was suddenly and hopelessly flat. NOOO!! While fumbling around with adrenaline and tools changing out the tube, dozens of riders that I had just worked so hard to pass came riding by. It was brutal, and took the wind out of my sails for a while. 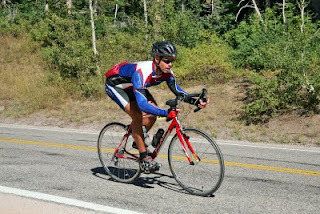 But, I dealt with it, utilized a pump w/pressure gauge which neutral race support came by and offered, and ten minutes later I was back in the race, tucking into the downhill that would take me to Highway 89 near the mouth of Salt River Pass. 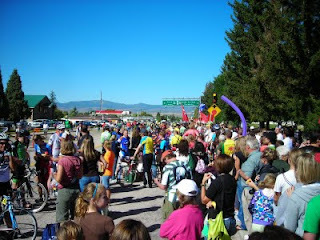 Here, we cross into Wyoming, traffic rejoins the race, and it is bedlam all the way to the finish. Cheering crowds are awesome. Temperatures were really starting to rise by this point, and the headwinds became crosswinds. I managed to tuck into a fast group through the lower sections of Salt River Pass, and began making good time again. 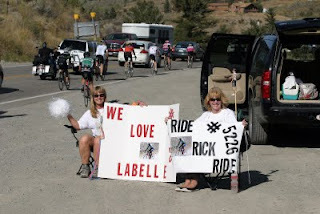 My family came driving by a couple of times yelling out encouragement, which helped keep a smile on my face. Mile 100 went by on my odometer...and then the pavement really tilted up. Groups splintered, jerseys were zipped open, and riders all suffered the singularly solo pursuit of climbing an 8% grade. 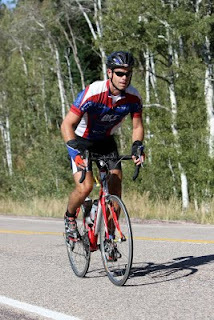 My mountain biking base kicked in, and I passed dozens of racers on the final 3-miles of climbing up Salt River Pass. 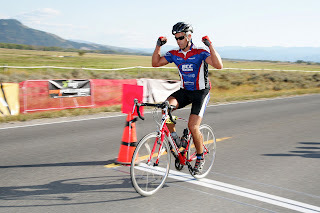 It was pretty wild to be feeling strong on a brutal climb, 110-miles into a race. The hamstring cramps thankfully stayed at bay, and as I neared the summit I saw my wife Joanne with friends Jon & Audrey, cheering wildly in the crowd. It was like a mini Tour de France scene, and I was pumped. The descent into Afton went by quickly, even though I pedaled most of it on my own. Afton-to-Alpine is a mostly flat, 34-mile section, and it was absolutely the low point of my race. Headwinds made it impossible to break away from any group, so all racers were bunched together into really long pacelines. Any time you get more than about 8 riders together, the paceline starts to yo-yo; if you're in the rear 1/2 or so, you're constantly accelerating & decelerating. This removes any kind of rhythm, and saps lots of energy from the legs & mind. I really & truly wish there had been another big climb in that section, but just tucked my head and endured the flats...and finally rolled into Alpine. Beautiful Alpine, WY: mile 159, 8 hrs. 29 min. Hot, dry, tired, achey, nearly delusional with fatigue. I unclipped from my bike, weakly asked nephew Blake to hold it, and stumbled towards the porta-potties. Halfway there I felt myself having a breakdown. 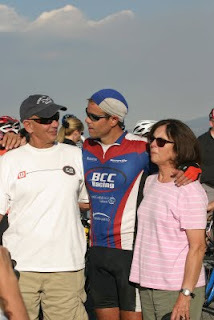 The magnitude of what I was doing, realizing I was going to finish or die trying; the decades of bike-riding memories; the love & support of family & friends that day; the incredible pain & exhaustion from the effort. I gave myself a pep-talk, doused myself with cold water, drank a tasty Monavie Energy drink that my sister Lisa provided, cracked a couple of jokes...and got back on the bike. Let's finish this beast! It was an absolutely gorgeous afternoon in Snake River Canyon, and the scenery helped pull me along. I thought of my late friend, Bill Townsend, who once roamed this country. Boaters floated the river below, fall colors dotted the hillsides above, cyclists pedaled bravely, and blue sky framed it all. I was happy to be exactly where I was, and could feel a bizarre resurgence of energy. Maybe it was the energy drink, or maybe this is an emergency supply that we all have deep down but rarely need to access in the modern world. Whatever it was, I was thankful. I made a conscious effort to stay in smaller riding groups to avoid the yo-yo effect, and it worked. 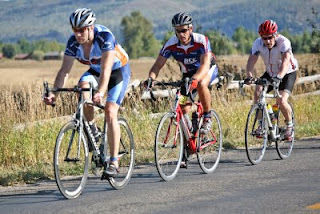 The wind also subsided, which allowed me to break away a couple of times and catch on to faster groups. By the time I passed my incomparable cheering group of Joanne, Jon & Audrey near Hoback Junction, I could taste the finish...and they spurred me on. Nearing Jackson and seeing the Tetons was incredible. 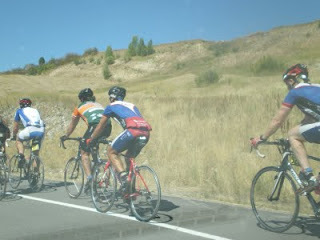 I was in a nice strong group of 5 riders, all working together equally. People lined the bike paths and streets, yelling encouragement. We crossed the Snake River one last time (I'll admit, I wanted to jump in and swim), made the turn towards Teton Village, and put the hammer down to the finish. I had been quietly watching my stopwatch and calculating time all the way from Alpine, vowing that I would finish in under 11 hours. With 5K to go, I realized that I would make it with some time to spare, and tried to just soak it all in. Alpine to the finish line was my fastest section of the day, and it was great to finish on a high note like that. It was also great to finally get off the bike, and hug everyone who supported & cheered me on all day. There is no Finish Line "festival," unfortunately...which means no food, drink, music, massage tables, nothing. The event is fabulously organized and run, other than that. Mom and dad: thanks for the love, and that first Schwinn Sting-Ray. Who'd have thought it would lead to this. I'm gonna take a few days off the bike now. Wonderful to see your parents get to see you live well. Remember not everyone gets a chance to do that. Thanks for giving a window into your life.